After several quiet months of no Whovian-related news, fans of Doctor Who were treated to a surprise with the unveiling of the first official set photo from the filming of Series 7. The seventh season of ‘Nu Who’ began filming this week in Cardiff, Wales, set for a later-than-usual Fall broadcast. You can see the new set photo at the end of this post. 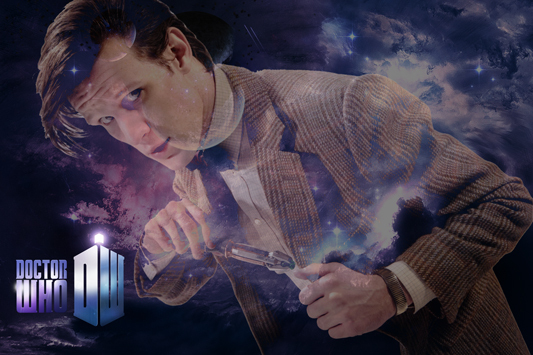 Doctor Who Series 7 will star Matt Smith, reprising his role as the Eleventh Doctor, along with showrunner Steven Moffat continuing the production behind-the-scenes. Companions Amy Pond (Karen Gillan) and Rory Williams (Arthur Darvill) are also entering their final series of the show, as the Doctor is to find a new companion this season. 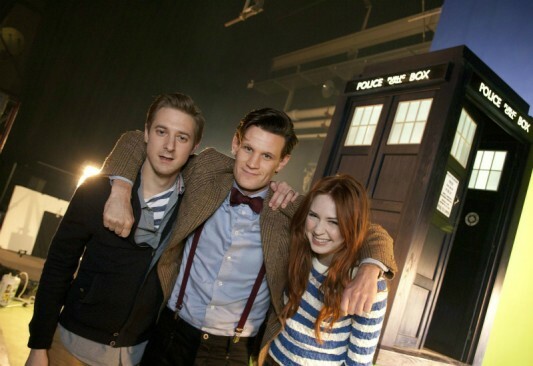 This series will see the last days of the Ponds with Karen Gillan and Arthur Darvill returning for their final, rollercoaster voyage with the Doctor. Amy and Rory have been at the Doctor’s side for more than two series but what will he do after their heartbreaking departure? Prepare yourselves for thrills, adventures and dramatic surprises as the show builds towards its enormous, climactic 50th anniversary year. Fourteen big, blockbuster-movie episodes – each a brand new epic adventure featuring new monsters and some familiar foes as you’ve never seen them before. What’s interesting in the press release that has some fans conjecturing (firstly) is the reference to “blockbuster-movie episodes.” There is question as to whether this means the television show will be taking on a longer running time, perhaps in the same vein as Steven Moffat’s other show, Sherlock. And the other question relates to the appearance of “some familiar foes as you’ve never seen them before.” This, of course, implies the possibility that we will see the return of a Classic Doctor Who villain. For what it’s worth, my money (and hope) is on the return of the Ice Warriors! Rumored guest star reappearances include the return of Alex Kingston as River Song, and with 2012 being a non-Torchwood year, there is word that John Barrowman may make an appearance as Captain Jack Harkness in the show as well. The BBC has also confirmed that Mark Williams (Mr. Weasley from the Harry Potter movies), David Bradley (Argus Filch also from Harry Potter), and Rupert Graves (Inspector Lestrade from Sherlock) will all have guest appearances in the upcoming season. Doctor Who Series 7 is said to be split in two halves as the BBC did with Series 6 last year. The first half is believed to be scheduled to broadcast in the Fall of 2012, followed by the Christmas special, and then followed by the second half of the series in Spring 2013. It’s rumored that Series 8 will follow directly on from the 2013 broadcast to make it a huge 50th anniversary for the longest running Science Fiction television show of all time.